This complete guide to ancient Greek rhetoric is exceptional both in its chronological range and the breadth of topics it covers. Traces the rise of rhetoric and its uses from Homer to Byzantium. Covers wider-ranging topics such as rhetoric's relationship to knowledge, ethics, religion, law, and emotion. 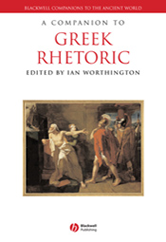 Incorporates new material giving us fresh insights into how the Greeks saw and used rhetoric. Discusses the idea of rhetoric and examines the status of rhetoric studies, present and future. All quotations from ancient sources are translated into English.